Two USC researchers have proposed a link between string field theory and quantum mechanics that could open the door to using string field theory—or a broader version of it, called M-theory—as the basis of all physics. "This could solve the mystery of where quantum mechanics comes from," said Itzhak Bars, USC Dornsife College of Letters, Arts and Sciences professor and lead author of the paper. In their paper, which reformulated string field theory in a clearer language, Bars and Rychov showed that a set of fundamental quantum mechanical principles known as "commutation rules'' may be derived from the geometry of strings joining and splitting. "Our argument can be presented in bare bones in a hugely simplified mathematical structure," Bars said. "The essential ingredient is the assumption that all matter is made up of strings and that the only possible interaction is joining/splitting as specified in their version of string field theory." Four decades later, physicists are still trying to hash out the rules of string theory, which seem to demand some interesting starting conditions to work (like extra dimensions, which may explain why quarks and leptons have electric charge, color and "flavor" that distinguish them from one another). "The commutation rules don't have an explanation from a more fundamental perspective, but have been experimentally verified down to the smallest distances probed by the most powerful accelerators. Clearly the rules are correct, but they beg for an explanation of their origins in some physical phenomena that are even deeper," Bars said. The difficulty lies in the fact that there's no experimental data on the topic—testing things on such a small scale is currently beyond a scientist's technological ability. It took the extension of Maxwell's Equations to 4 dimensional tensors in complex space to unify electromagnetic field theory into a single equation. The unification of GR and QM could require a similar generalization of the mathematics. 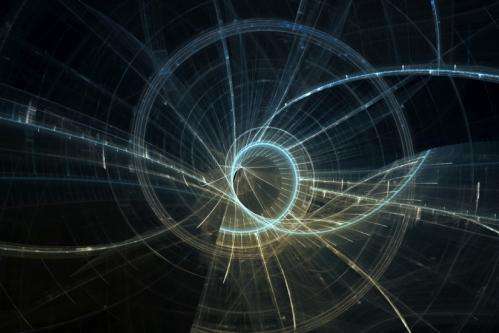 "String field theory could be the foundation of quantum mechanics"
Einsteins general relativity is used on the large scale, not Newtonian physics. So there is no way to actually prove the theory, owing to the small scale of the subjects in the theory? Why not do what the global warmers did? When faced with uncertainty due to myriad unpredictable conditions and millions of variables, they simply invent models and massage the data until it appears to fit. String theory is definitely intriguing, but I get hung up on the fact that it's almost completely physically untestable. Theories are supposed to be physically testable. This is definitely one of the most interesting approaches to the conundrum: strings precede the quanta (quantum mechanics). I have always had a hunch the underlying principle will be more like musical harmonics (they emanate, and are referential not categorical). The authors should try to gain further insight from the creative arts like music and painting, and call the new theory adopting this approach "TUNING THEORY or EMANENT THEORY or EMANATING THEORY"! Ultimately the bottom-line of our cognitive mental process is that we just "emanate into our grasp of existential reality". The idea that we shall arrive at an absolute categorical certitude of nature sounds far-fetched, rather it is a referential certitude or emanating understanding, hence tuning theory, just as we have an emanating/referential grasp in the creative arts. Categorism is contradictory in the sense that it seems to imply absolute certitude why at the same time we know we don't have absolute certitude! Seriously, just a heads up. I didn't read your posts simply because of this... "The final step in understanding of the quantum mechanics is the understanding." Bro... Slow down or give up. You don't even "begin" to make sense so how can you "end" up with any kind of result at all? I am not attacking you in any way because honestly I wish progression on everyone but there comes a time when you need to realize your strengths and your faults. No... You need to take things seriously and work on the way you portray your ideas. Then and only then can you actually begin to do anything. I am by no means on a level even close to some of the people here but I can still recognize that you need to start from scratch and learn critical thinking 101. The only reason I am taking the time to comment is because I believe that you may be able to actually contribute to science if you step down from the unstable pedestal you have been residing on for so long. How about reasoning from the angle that all physical categories (matter, energy, gravity, etc.) are just harmonies of a tune! This can certainly form the basis for "referencing" (and not categorising, which we tend to do) the development of a TUNING THEORY or HARMONY THEORY or EMANENT THEORY or EMANATING THEORY or BECOMING THEORY! Noting that the (tuning) referencing subsumes and precedes the physical categories we tend to be obsessed with. More like an artist's (say a musician or painter) underlying creative swing/tuning/impetus/vitality is behind the harmonies/subtleties that emanate into an "expressive form", the categories we perceive! In other words, so-called "string theorists" should seek to articulate conceptually the "expressive form"/categories (matter, energy, gravity, etc.) in terms of an underlying swing/tuning which precedes and emanates into-and-through the categories, instead of wrongly seeking validation from the categories as if the latter is preceding! Ok. String theorists cannot produce any new testable predictions. "All matter is a topographical defect. Hence Cosmic strings are everywhere, everything we see is a cosmic string. Each "Cosmic string" is the twister created by this defect attempting to move it's way back to 0 and reconnect with all the missing parts that are that spread across infinite universes (more like Sliders, then Energy Loaf). These bits of defect constantly swirl down (4D twister, not 3D). As they move, they swirl through every universe. As a defect leaves our universe it leaves a vacancy, where another small defect from our side of zero can move into. The first defect has since moved to another universe. This accounts for why particles in our universe seem to blink in/out of existence and move all around, this is why we can detect either the particle or the direction - but not both. If we attempt to detect that same particle later, we can't - it has since swirled through the "4th" dimension to another universe. What we detect now is the defect that filled in"
To add to my earlier quote (It's an old post on here). String theory, if you want to call it that; is only part of this. There is a lot more to consider. String theory prefers more of an energy loaf universe. In a way that is true, but it also isn't true. We are connected to every fabric of energy and we are all on top of each other. The over all value of every universe is 0. There isn't actually distance between particles, but then there is. Infinite is an interesting thing, especially when there are multiple infinite curves all interacting. Scientism for "string theorists" is achieved from "playing the right tune, possibly tunes". Allowing effective predication of expressive forms/categories in singular insight; with the categories (matter, energy, gravity, etc. ), from infinitesimal to very large states, having underlying preceding-subsuming tuning coherence. Avoiding the contradictions displayed today with the categorical theories, in particular, by putting enhanced emphasis on all-pervasive concepts like time and space for tuning. An exercise in creative tuning insight translated into mathematical harmonies. It's not just about one tuning construct (as with categorical theories of relativity, gravity or quantum mechanics); but possibly an infinity of referential tuning such that the very notion of "right emanating/becoming tunes of expressive forms/categories" is itself tuning theory, more like music theory is all about right emanating/becoming expressive form! The emanence/becoming is precedingly intemporal! Well, with the approach the authors propose it would be testable - since they have constrained their theory to splits and mergers. This should enable the theory to make quantummechanical predictions and allow for the formulation of tests. Nice to see that String Theory is copying my theory -- Spring-And-Loop Theory. ".... Avoiding the contradictions displayed today with the categorical theories, in particular, by putting enhanced emphasis on all-pervasive concepts like time and space for tuning." Another all-pervasive subsuming concept for tuning theory, apart from time, energy and space could be scale or scaleability which by its own right could justify physical phenomena! Besides "all-pervasiveness" by itself might emanently/becomingly be a "morphing notion" that as such inherently subsumes/undermines an absolutely categorical and traditional perception of the notions of time, energy, space or scale! All we perceive is pure energy. Matter is an illusion created by the interference patterns of the interaction of this energy. Just like no one tool is suitable for any given job; no one formula is suitable to describe everything. Everything is POSSIBLE; but, not everything is PLAUSIBLE. @silverton, you definitely right, not everything is PLAUSIBLE. But everything that predicates is plausibly a solution to the conundrum! The bottom-line of the speculative notion of tuning theory, is effective predication which is basically the bottom-line of scientism! String physics is based on a very simple idea: particles are not zero-dimensional objects, like Euclidean points. Instead, they are extended objects, strings (one-dimensional) at minimum, and other extended objects of higher dimensionality called "branes" which are the generalization of strings to higher dimensions. The base of the theory is GRT; Theodor Kaluza showed Einstein that Maxwell's equations could be derived in the same manner as Einstein's equations were, by adding one extra dimension and proceeding as Einstein did to find his field equations. String physics isn't really a "theory" other than in the sense of being a mathematical treatment that yields all of the previously-known physics; its predictions at the level of quantum mechanics, unfortunately, are beyond our technical ability to test. However, it also makes some cosmological predictions, which have turned out to be correct, and we have not yet exhausted examination of cosmic rays. Deriving the commutators (that is, abelian transformations) and anticommutators (i.e. non-abelian transformations) which form the basis of all physics from the assumption of string physics is an extremely powerful result, just as deriving the Maxwell equations from the Einstein method with an extra dimension was an extremely powerful result. This is a hint to deep physics, and a fascinating result. It's not hard evidence, but it's sure persuasive given what we've seen so far. It's especially interesting that anticommutators form a basic part of the Dirac equations. They are indeed deriving the Standard Model from string physics, and the inability to do this has been a standing problem with string physics; its prior inability to yield a universe that looks like ours. A universe with commutators and anticommutators looks very much like our universe, and it's extremely important that such a universe can be derived in this way. To understand what a non-abelian transform is, and how pervasive they are in physics, consider a die. Its 6 face is toward you, and the 3 face is on top, and the 2 face on the right. The 5 face is on the left, the 4 face on the bottom, and the 1 face away from you. Now, rotate the die 90º "up" and the 6 face is on top, and the 4 face is toward you, and the 2 face still on the right. Now rotate it 90º "right;" the 4 face is to the right, the 5 face is toward you, and the 6 face is still on top. Now do it the other way; rotate it 90º "right," and the 6 face is still facing you, and the 3 face is on the right, and the 5 face on the top. Now rotate it 90º "up," and the 6 face is on top, the 2 face toward you, and the 3 face still on the right. Note that the results are different. This is counter-intuitive, but easily demonstrable. Most people, having been exposed to the commutative law of mathematics, assume that rotations commute; however, in 3 dimensions, this is incorrect. The collection of operations that represent all (and only) the rotations of a cube in 3 dimensions is therefore, by mathematicians, and physicists, called "non-abelian." As we can see, the rules in real space are non-abelian; they do not commute. A ⊗ B ≠ B ⊗ A is the rule, not the exception. BTW, note that the non-abelian symmetry group of rotations in 3-dimensional space is called the "SO(3) group," designating the "special orthogonal group of dimension 3." There is only one such group, indicating that a 3-dimensional space cannot have any more, or less, rotations (AKA "operations") than are described in the algebra of this group. These are inherent characteristics of space as we experience it. It's furthermore worth mentioning that the symmetry groups of the three quantum forces are U(1), SU(2), and SU(3) respectively for the EM, weak, and color forces. These are the "unitary" and "special unitary" groups of dimensions 1, 2, and 3. No group has been assigned to the gravity force, which is of an unknown type, and presumably of dimension 4 given GRT. No known group yields quantum gravity of a reasonable sort (i.e. quantum gravity that does not predict infinite probabilities). Mathematical research to identify such a group is ongoing, and major efforts include string physics, loop quantum gravity, and twistor physics. See Garrett Lisi's "Exceptionally simple theory of everything." This is a model problem, but it is of the correct type. Lisi, incidentally, never claimed anything more, despite a lot of BS about how he was proposing a real TOE. So when string physicists talk about ten dimensions, they mean the four of gravity, that is spacetime, the three of the color force, the two of the weak force, and the one of EM. The eleventh dimension is an extension of strings into branes, that is one dimensional manifolds into two or more dimensions, devised by Edward Witten who is generally acknowledged to be the greatest mathematical physicist of the current generation. It was he who pointed out that supergravity is the sixth string theory. And it is due to this that physicists are searching for indications of superpartners of the known Standard Model particles among the traces gleaned from the LHC. The gravity group is certainly not the obvious SU(4), nor is it SO(4). These solutions have been tried and found incorrect. Nor is it clear that when we do find the group that represents the symmetry of the gravity force, we will determine that it is a member of any knowable group. But given the other three forces are, it seems willfully obtuse to insist it cannot be. There are many powerful and substantial hints that string physics points the way to where we must go to understand the underpinnings of quantum mechanics; this is why so many physicists are so avidly pursuing it. However, it is also good that others like Penrose and Smolin are following other paths, and multiplying our intellectual force. Simply because a conjecture seems unlikely is no reason not to test it if a valid test is proposed. But there must be a valid test. "...Moyal star formulation of string field theory (MSFT)..."
"...In the new version of MSFT..." -- Windows 10? Geez, I knew I had you on ignore for some reason or other. I think that's about the dumbest Microsoft conspiracy theory I've ever heard. Having actually witnessed some of the real conspiracies, like WINS vs. DNS, I find this stuff laughable, like flat-earthers, 9/11 conspiracy nuts, and climate deniers. Microsoft marketing has made some seriously demented (or inebriate) maneuvers, but seriously, they've never tried to hide HAARP or chemtrails, and they're not an arm of the NSA. Let's try to avoid eating the banana with the skin still on. this shows that aw/daw is not possible, feasible, nor can it be relevant or exist as it is shown to NOT exist to an incredibly high degree of accuracy! Hey, I wanna smoke some AWT. Does it cause brain damage? Subtitles for humor impaired: both quotes are from the original arxiv article. The Windows 10 appendage is mine. On serious note, the fact that nobody mentioned Moyal product here is quite telling about the discussion level, doesn't it? I think I recall putting you on ignore because you tried to claim black holes can't exist. Or was it that evilution isn't in the Babble? Hmmm, or perhaps that there's no global warming (a typical claim of those who cannot count). Maybe you remember. I'm having trouble caring. It doesn't matter what you think or recall. Nowadays all conversations (no matter how silly) are recorded. Provide the reference. No need. You were a climate denier. I still am. How does it relate to black holes, time arrow, and Moyal star product formulation of string field theory? In modern academia has more craftsmens than real discoverers, whose main idea is tinkering abstract ideas and discussion of a fictional reality, which can provide a quiet life and a warm workplace to retirement, but are not very useful in real science. These theories and hypotheses that attempt with impossible to monitor phenomena to explain reality are very convenient for this purpose. These theorists are in quite comfortable situations and have to prove that something fictional, invisible and intangible exists. This requires a lot of time. Maybe all the time in the world? Some craftsmen in science are engaged more with scientific popular movies than with real science. Reasonable scientists refuse to participate in this parade of stupidity and not engage in absurd situations, thanks to the helpful rational thought, honest attitude towards science and strong connection with reality. Nicely laid out description. Got it. You're inclusion of the die analogy was GREAT. Represented spin dynamic perfectly and assist me in solidifying a line of thought I have been following. BTW - Was gonna mention Lisi in the last comment I made about the necessity of a knot theory. Good call. But their ideas are not so popular in academia and scientific media, which brings me to the thought that modern science deliberately running away from reality, inventing their own reality for comfort. The idea of ​​the strings is interesting, but when you get to the part with 11 or more dimensions, some of them hiden in the fabric of spase and microscopic vibrating strigs, which can never be observed, we have again the same situation. Invisible physical phenomena that need to explain the world without being able to be tested and monitored. Convenient from a certain point of view, but useless. Theory which can not be proven by experiments has no scientific value. I'd argue the opposite. There are a lot of plausible sounding things that aren't possible. 'Plasuible' is an evolved perceptive ability that is limited to what is useful to the human, biological form. Outside of that (i.e. anything that is smaller than a millimeter or larger than a few kilometers) our ability to discern what is plausible from what is not is no better than pure guesswork. @Da Sneib. Great postings on string physics. I am reasoning the problem from an intuitive creative philosophy angle. Have you got anything to say about the mathematics/physics of string theory, with regards to the "notion of nothingness" (as idiosyncratic as it might sound, "something that is nothing") as the absolute referential purveyor (tuner in my jargon) of "emanating/becoming" dimensions, and thus creating our perception of categorical constructs like quanta, atoms, energy, space, light, gravity, etc.)! The intuitive foundation of the notion of nothingness, from a creative painting or music experience, being the idea that you can generate various "expressive forms" depths (dimension) out of nothing basically just as you vary/tune (vitality/impetus) your paint stroke or musical harmonies. But at the same time, just painting or playing music without an underlying vitality gives nonsense! The insight: understanding such a "vitality notion" might be the key! A fascinating toy model, reversing the usual QM on strings -> ST to ST -> QM and strings. Also, the toy model only covers open strings, meaning gravitons (and so spacetime) may be naturally non-commutative. So, the usually feeding frenzy of charlatan personal theories whenever a speculative and/or exotic physics paper is published. You have to laugh, so thank you guys! Keep the idiocy coming. @jjconnor: "String theory is definitely intriguing, but I get hung up on the fact that it's almost completely physically untestable. " ST _has_ been tested, say correct black hole entropy. And it may be very future testable, say BICEP2 inflation scale, or landscape anthropics, or antialias suggestion. The current problem is that while it is a useful physics tool, it has not passed exclusive tests on predictions other theory has made or made. @Da Schneib: "its predictions at the level of quantum mechanics, unfortunately, are beyond our technical ability to test." Depending on what you mean with "the level of quantum mechanics", we don't know that yet. Say, if BICEP2 is sufficiently correct, because Planck saw mostly noise instead of dust (as it looks from its modeled polarization pattern), it probes string theory on the quantum particle level AFAIU. What if the real issue with our grasp of string theory is one of "confusion in methodology", with "testing" implying we have "absolute notions of certainty in our present categorical physics to test string theory", rather than the idea that "string theory is the preceding and subsuming reality and provides the "real insight" on our categorical physics conceptions". More like working on certitudes of Newtonian physics and trying to test the validity of Relativity? It sounds like some of the problems here have to do with hitting fundamental walls that the Planck scales put up. How do you formulate a framework for the ultimate resolution of a system that necessarily requires you to use concepts and assumptions that lie outside that framework? Explaining how the 1080p resolution on my TV works requires that I talk about things that are smaller than that resolution (photons, electrons, etc). What is smaller than the smallest thing possible? Can there be an "ultimate smallness" that isn't built of yet another level of smaller units, concepts, and scales that it operates within? String physics (and gauge theory physics, as well) seems to be saying that dimension is the most important determining factor of the physics of our universe. The definition of "nothing" seems not to include dimension. In other words, there are many types of nothing, with different dimensionality. This dimensionality controls what types of virtual particles can appear in nothing, i.e. the vacuum. So not only is nothing a pervasive concept, but there is more than one type of nothing, depending on the dimensionality of the vacuum it describes. why would anyone want to have a serious discussion of physics of A when you cannot comprehend the basics which are known and applied in studies which support physics B? There are models for both open and closed strings; however, gravitons must be closed strings to yield a theory of quantum gravity. Photons, however, are open strings. @TheGhostofOtto1923. Yep but most physics theories were developed by unorthodox physicists to the best of my knowledge. Strings are an emanating/becoming notion (an emanating/becoming notion or vital notion unlike a categorical notion precedes explanation and defines explanation, thus strings are inherently beyond explanability/non-contentious but rather inherently right by their inherent manifestation) whose "inflections/constraints" is the reason for our grasp of categorical notions (quanta, time, space, energy, etc.). The insight here is that hitherto our knowledge system has traditionally been an inclination to identify, define, classify, characterise, qualify, categorise and predicate concepts thereof, to arrive at certainty. The idea behind strings possibly goes beyond simply that exercise, by "referencing" (not categorising) emanating/becoming reality! Our categorical perceptions (atoms, space, quanta, energy, etc.) being just inflections/constraints of string theory. Pardon the craziness, derived intuitively from creative arts like music where inflections/constraints [the tuning of the pitching, loudness, duration, timbre, etc. of the notes (string)] are the key in creating the depths of the expressive forms (categories); noting that the inflections/constraints have no justification but for the fact that they deliver the expressive forms(categories), i.e. they are "precedingly justificative or intemporal"! The possible insight for the physics: string theory might possibly be about going beyond just a categorising exercise, to grasp an emanating/becoming conceptualisation of meaning in the physics, basically an "intuitive creative science that satisfies/references/tunes to the conditions/phenomena of the categories"! Your sort of knowledge derives from the surreptitious palpation of various erogenous zones. I would surmise. 'Le Grand Masturbateur' nest pass? This accusation flies both way. It is you who's world view is skewed by deeply emotional attachment to the idea of mankind guilty polluting "pristine" planet. Hence, you are biased and can't possibly rationally discuss this. However, I give you benefit of a doubt and suggest that you may actually hold healthy opinions in other areas and be overall capable individual. The Earth is the only place humans have survived in all the universe. Is it your belief that our "purpose" is to make it unlivable? Do you really believe that keeping our own house clean is a "librul value?" Do you really prefer living in a mess? I clean my house regularly. Don't you? Woo! Woo woo! Crazy train coming through, woo woo! The debate is not about clean house. It's a fight for thermostat. You prefer 2K colder temperature and pay no attention whatsoever to electric bill. @Da Schneib in your die example are you considering what are usually called (for the layman that is) 'spinorial objects'? This then leading to Spinor theory but I have to admit the notation of representations (SU(4) etc) of such has always been a little confusing to me and my books don't do a very good job on explanation. Could you direct a layman to where explanations, like yours, can be found? Sorry to bother you again. @tritace, the Abelian and non-Abelian transforms are certainly excellent concepts, particularly, with non-abelian pervasiveness! However, why the obsession with dimensions principally, how about asymmetrisation? One will think non-Abelian transforms should perfectly represent the emanating/becoming vitality/impetus which inflections/constraints with the abelian transforms references/tunes to our perceived physical categories (quanta, time, space, energy, etc.). When talking of the notion of asymmetrisation over dimension, I am referring to the "rule of reactive excepting" which by itself generates a conceptual vitality/impetus which probably doesn't need a mathematical overemphasis of dimensions. Taking the case with genes and genetics for example, just by the simple rule of asymmetrisation where symmetric rules are not adhered to exactly (mutation or rather "reactive mutation") we have the complexity of evolution! What if that is the true insight to string theory? Getting over, or seeing beyond, our traditional obsession with the "physics of symmetry"? Basically string theory representation may boil down to an Abelian transform abstract matrix over which a non-Abelian transform abstract instigator is in asymmetrisation (vitality by "rule of reactive excepting") which then references/tunes to our physical categories (quanta, time, space, energy, etc.). The issue then is what's the mathematics, or maybe rather algorithm, for such a "rule of reactive excepting"! And on the philosophical/existential level, what is it's "intemporal preservation"? @tritace thanks for taking the time. Yes I am aware that Bosonic String theories don't incorperate fermions while Superstring type II don't allow nonalbelian guage symmetries (QCD, electroweak). Apparently adding charge at the ends of a string lead the way to heterotic theories, SO(32) Spinors. I hasten to add that although I admire the maths I wouldn't call myself an AW or SS (SUSY) person. But my question was in regard to Group theory in general. However, I have to withdraw my question because 'veI found some texts that I purchased (to answer that question) some time back but as I was moving house I never read them. Talk about getting old eh? Asymmetry (or rather teleology by assymetry) is a pervasive process behind the idea of vitality (physical, biological and even social), notwithstanding our reflex to seek symmetry. "Louis Pasteur proposed that biological molecules are asymmetric because the cosmic [i.e. physical] forces that preside over their formation are themselves asymmetric. While at his time, and even now, the symmetry of physical processes are highlighted, it is known that there are fundamental physical asymmetries, starting with time." ALGORITHMS are in essence emanating/referencing/tuning/vitality constructs, and what if our categorical physics notions of quanta, space, time, energy, gravity are simply perceptions of a "complex underlying algorithm" (an Abelian transform abstract matrixing principle over which a non-Abelian transform abstract instigating principle is in asymmetrisation); implying reviewing our categorical approaches like dimensions! and you feel this is "rational discussion" on a science site? you cannot see your own emotionally skewed perspective there? you cannot see how your faith has led you to ignore science? @Da Schneib in your die example are you considering what are usually called (for the layman that is) 'spinorial objects'? Yes. Spinors represent the way spin-1/2 particles behave when rotated. A 360° rotation changes the sign of the spinor; another 360° rotation changes it back. This leads to the Pauli Exclusion Principle which prevents two fermions with identical quantum numbers from occupying the same spacetime location. This then leading to Spinor theory but I have to admit the notation of representations (SU(4) etc) of such has always been a little confusing to me and my books don't do a very good job on explanation. Could you direct a layman to where explanations, like yours, can be found? Sorry to bother you again. You are entering deep water. I don't know of any explanations of group theory that are at the layman level. It's almost as complex, but in a different way, as calculus. And BTW, Mimath, you always ask good questions so it's no bother at all. Keep 'em coming! Got anything to say about mathematics/physics about "my philosophical idiosyncracy" Da Schneib? Why not to admit, it's just you, who is bigot troll here? that is why you will NEVER comprehend the amazing science out there that is real! because you still cling to your own FAITH in your personal intuition! @Da Schneib yes you're right although most calculus I & II texts follow a certain pattern that seem to lead naturally into III and beyond (diff. eqs., vector and tensor, variations etc.). I have a reasonable background in Logic and Set theory so I've decided to approach my problem from there, going on to elementary number theory (Jones) that include some group theory and then on to more advanced texts...wonder if I have enough time Ha! @tritace I have read a little AW theory (Rado, Birkhofer) and I have some fundamental issues (body centered lattice aether spheres with almost 32% of empty space at the quantum level which is almost a contradiction of the theory, for example). But I am not widely read on AW theory and various offshoots so I tend to stay in mainstream physics. However I do appreciate your explanations, so thank you. @tritace I understand these points you are making but although higher dimensional maths is well established they are abstract. There is no definite physical proof that hyper dimensions exist. Compactification is another problem since mainstream scientists are unable to probe those levels to confirm or deny. Interesting though. I always said that if I can describe the Unicorn on the British Coat of Arms...then they exist! In fact Unicorns are more concrete than hypothetical extra dimensions...but they aren't alive. This is one equation of extra dimensional gravitation, Gδ x (m1m2)/(R^δ r^(2+α)). R is the compactified (extra) dimension and the problem is that R is much, much smaller than r and other forces can mask measurement of G. Until we are able to probe such scales (unlikely in the foreseeable future) this one equation remains just that! It remains untestable at the presnt time and no one knows if describes a real entity or not but in your terms it is real. Tally Ho on my unicorn! And what if string theory is an underlying threading fitment algorithmic principle whose constraints/inflections/tuning/referencing precede and generate our categorical dimensions and their manifestations? Why should dimensions be a given as a first principle? What lies beyond the notion of dimensions? How about perceiving string theory as an underlying equilibrium puzzle, in asymmetric paradox, which in its quest for equilibrium generates dimensions and their manifestations as our physical categories! In which case our underlying perceptions of physical categories may not actually be absolute, but rather "occasional manifestations" of the equilibrium puzzle quest for equilibrium; and such a notion may actually be trans-universal, i.e. with all sort of manifest possibilities and universes! It can't get crazier than that or can it? ahhhhh this ignore user button! A lot less aether waves on the water surface muddling my daily dose of physics news. It makes sense to me. If there is any truth in string theory it should also predict anything what is common in QM and GR. Why isn't this thought of before? I'm just guess it would say something profound about string (field) theory if it is able to just as accurately predict what we know as QM would. That is, if a new type of "asymmetric paradox natural algorithm" (the tuning) which generates dimensions and their manifestations can be developed! Noting that it is about the tune; more like grasping the "comprehensiveness of musical harmonies" from which the "expressive form"/categories emanate; and not just grasping discrete notes in the music (as the traditional string theories seem to do) as we lose sight of teleology/vitality/referencing! @erson. Physics has been held up for 60 years now because no one dares think outside the box! There is nothing to lose speculating, right. It's hi-time physicists/mathematicians/cosmologists let lose their intuitions for the sake of physics. There will always be a hierarchy of thoughts: from proven and established formal theories, and outright speculation! imagine you are standing on a large rotating wheel facing inward with a given set of mirrors in the inside of the wheel, representing different emanating/becoming/referencing categories of dimensions and their physical phenomena as you rotate around the center of the wheel. But at any given point at which you are standing on the wheel, you can only have one given emanating/becoming/referencing categorical impression of how dimensions and their physical phenomena manifests themselves. To have a fullsome picture (tune), you need to understand the underlying reference principle of the rotating wheel on the various mirrors at various points of the wheel. I.e. "the music of the wheel" or "the music of the organ" or "the music of the musical instrument". Basically, string theory as such would be about going from a referential "deductive insight" to have a big picture, rather than, the traditional approach of categorical "inductive insight" which will tend to be blind to the conceptualisation! Boring!!! Do you like the sound of your own voice? Would be more interesting if you made any sense at all. felicien_perrinn fancies himself a philosopher. Personally, I think he's over-proud of not too much. Dunning-Kruger, you know... Poor thing. Why the complex? Is unorthodoxy that scary? By the way, mark that expression "asymmetric paradox" (therein lies, the theory of everything, literally everything, "not only everything physics")! @ The Zephir-Skippy how you are Neg? Where do you come up with these names you come up with? You must have 60 or 50 different names to twaddle on the physorg with, how you keep them all sorted out so one doesn't talk to the other one? My spider senses say, "Yes, that's Zephir." If it mentions AWT we'll know for sure. [String physics] does even use(sic) the canonical second quantization instead of classical one(sic). There is no "classical quantization." It's a contradiction in terms, and looks like word salad. Meanwhile, second quantization is used in all QFTs. Are you seriously arguing second quantization is "wrong?" How exactly? @elicien_perrinn Why should dimensions be a given as a first principle? In fact, dimensionality is the ultimate reality. Movement is not something that exists only inside of human skulls; it's a feature of reality (at least in our universe). The dimensionality of the universe determines its conservation laws; see Noether's Theorem. Not really, I get the impression what many physicists are doing is like the blind men who came across an elephant; one will touch the ear and says an elephant is a flat fish, another the trunk and says a snake, etc. You need a deductive insight and not dodging what you don't understand to validate your preconceived theory! Wrong and wrong. There is no vitality in a notion like dimension, just a categorical invention of man! All true notions have vitality and are "becoming" notions (asymmetric not symmetric). In fact, the more succinct referential/becoming notion will be scalability. It is hi-time physics turned to natural algorithms (and not concepts of dimensions)! The insight is that the vitality/teleology/becoming of any system is for its "intemporal preservation", and our realisation/existence implies it is effectively preserved. The only mathematical concept that best grasp intemporal preservation is an asymmetric natural algorithm (going beyond a finitary relation). Now at the small scale, with recurrent asymmetric principle by the symmetric matrix principle (quanta level), it is likely that transformation will be unstable but possible since the asymmetric principle will be less influential on the symmetric matrix principle (explaining why quantum level phenomena are evasive) but as the asymmetric principle is increasingly integrated with the symmetric matrix principle, transformation is stable. This explains the relative stability of the rules of larger systems (classical physics), even though it is the same asymmetric principle by symmetric matrix principle relationship, with the difference being one of scalability! This whole notion is what is called ASYMMETRIC PARADOX (basically a becoming/vitality theory of everything)! The rules of such a transformation (creation of new dimension and their rules) are best understood by a tuning algorithm exercise, more like music is best understood by grasping referentially the developing harmonies, and not just identifying categorically disparate notes and sounds in music; better still, more like understanding the the elephant body system comprehensively, and not just holding the trunk, leg or ear like the blind men who came across an elephant and saying accordingly an elephant is a snake, trunk or flatfish! It should be noted that the vitality of "the asymmetric principle by symmetric matrix principle relationship" is not a conscious quest but rather a quest to establish intemporal preservation/equilibrium which paradoxically transforms! Such an understanding of asymmetric paradox physics mathematics will garner a lot of insight, for example, by understanding a field like genes and genetics; i.e. how mutations (by an asymmetric principle) acting on organic matrix (symmetric matrix principle) in quest for "intemporal preservation" led to transformation (single cells, multiply cells organisms, and complex creatures that belies the principle of evolution). Basically there is therefore no need to unite QM and GR or rather this is already coherent by the notion of (asymmetric principle by symmetric matrix principle relationship) scalability of "tuning-string theory". Thus explaining why and how QM phenomena are relatively evasive at the small scale and why and how GR phenomena are relatively stable at the large scale, i.e. string theory is then a contiguous theory of (asymmetric principle by symmetric matrix principle relationship) scalability effect, as the all-pervasive notion! Such a scalability concept rules, introduces the principle of information/backcues, i.e. the asymmetric principles explore possibilities, and where these explorations succeed, these influence the symmetric principle matrix and strengthen (hence the phenomena of dominance and recessiveness is not limited to genes and genetics but is a universal phenomenon that allows for varied symmetry possibilities), and explaining the universal variety of physical, biological and human social phenomena! There is no such thing as dimension (categorical) but contiguity (referential), lol! Felicia perrin - are you related to Reality Check, by any chance? You can't have a theory of everything with the categorical notion of "dimension", emanating/becoming "contiguity" does the trick! Do away with the notion of "dimensions", and introduce the notion of "inflexive contiguity", and you are half way there to the theory of everything! To which 'law' of contiguity do you refer? In your case perhaps that of psychology? That of conditional response lag time? The idea is that dimensions imply a categorical predefined construct in absolute symmetry in which notions exist and evolve, whereas contiguity will imply inherent emanence/becoming of notions which in their inflection define "dimensions and their rules" (involving excepting/asymmetric manifestations). There is a very subtle difference there which is actually a big as physicists and scientists go about trying to study physical phenomena in a preconceived mold. All natural phenomena are full of principles of exception/asymmetry but man is obsessed with symmetry/categories; universal "inflexive contiguity" will account for exception/asymmetric manifestations. Emanating/becoming-inflexive-contiguity-scalability manifestation should be the deductive insight to the theory of everything, and unification of all theories; scalability referring to how dimensions and their rules arise teleologically; from QM, GR, biological and social phenomena. Noting that the notion of scalability implies inherent emanent justification of successive scales as phenomena at grander scales make their own natural teleologic dimensions and rules, and are more than just constituents of smaller scales phenomena (which have their own inherent natural teleologic dimensions and rules by virtue of their scale). The distinction with our present categorical dimension construct is that, the latter seeks to construe all phenomena in the same flat teleological categorical frame (for instance, trying to construe QM and GR in the same categorical frame). And here is where the notion of scalability tuning-string comes in implying a becoming/emanent inflexive contiguity! The issue though is to know whether gravity is the stabilising agent or gravity is rather a dimensional manifestation of the stabilising agent at large scale? I.e. does quantum gravity exist? Why are the principles of GR naïvely adapted to QM? They are inherent at their given scale. Scalability is emanently self-justificatory and precedingly intemporal to our categorical conceptions. It's just as if trying to explain cooked rice in terms of uncooked rice, the heat agent is a preceding and subsuming notion. The problem lies with our psychological complex with our "conceptual notion of categories" and "categorical dimension" (back to becoming/emanent inflexive-conguity-scalability as the theory of everything)! I don't know why physicists are wasting their time in search of categories instead of grasping the reference/tune (asymmetric inflexive-contiguity teleology from nothingness)! It's like going categorically after notes of music (which can be infinite) to understand music; the big picture is understanding how the music develops from harmonies! I don't know why physicists are wasting their time in search of categories instead of grasping the reference/tune (asymmetric inflexive-contiguity teleology from nothingness)! It's like going categorically after notes of music (which can be infinite) to understand music; the big picture is understanding how the music develops from harmonies! At that point you can generate any particles you want! The fact is human civilization arose from a lot of "babbling" from some of our venerable ancestors the early-men, I'm just looking to take a page. Without the so-called "narcissism" we'll certainly not be here and we won't be going further afar without some of that so-called "narcissism"! In any case meaning is a question of perspective, Galileo was certainly a narcissist to medieval establishment like most of those who created the science and positivism, anyway! All establishments have a false sense of certainty but intrinsic reality or veridicality ends up showing there is no more narcissism than in "establishments and herd mentality"!